R Reyed. Novel Hybrid Entrapment Approach For Probiotic Cultures And Its Application During Lyophilization. The Internet Journal of Microbiology. 2006 Volume 3 Number 2. Probiotic cultures Lactobacillus platarum No. 8P-A3 (L.B.A3) and Bifidobatrium bifidum No.1, 791 (B.B.791) were lyophilized and preserved by novel entrapment system. A novel method based on hybrid encapsulation - entrapment technique, therefore, this method was explored to overcome the problem faced in each entrapment and encapsulation methods. The hybrid entrapment was achieved using different carriers for encapsulation sodium alginates for entrapment. The success of this protocol was estimated in terms of the number of surviving cell after freeze drying. Both probiotic cultures in hybrid - entrapment system (D) showed high survival rates, until now , little work has been published on improving the survival of probiotic bacteria to these condition, but novel technique such as hybrid entrapment is very promising. These results could be utilized in formulation technology of probiotics as a starter in dairy products as well as the emergence of new application. The gastrointestinal tract harbours a complex and diverse ecosystem of microorganisms and the mechanisms by which gut immune and epithelial cells handle this constant antigenic stimulation are only beginning to be understood. The large intestine contains over 400 different microbial species. The autochthonous microbiota, which are the dominant microbiota in the colon, limit the ability of pathogenic genera including Escherichia, Clostridium, Salmonella and Campylobacter to attach to the lumen (Ziemer & Gibson, 1998). Just destruction of the normal resident microbiota (not deficiency of the T-lymphocytes) is the factors which makes the individuals highly susceptible to potentially harmful bacteria and parasitic opportunistic infection is often seen, among these bacteria, Clostridiae spp. are certainly the most important group, well known for their associated morbidity, this leading to the eradication of colonization resistance, Mental health problems; chronic fatigue syndrome; muscular soreness and stiffness; autoimmune disorders: including lupus, rheumatoid arthritis, ankylosing spondylitis, enteric arthritis, and Reiter's syndrome; lactose intolerance; infectious diseases; high blood pressure; menopausal problems in women; vaginosis; allergies and asthma; kidney stones, may occur. The probiotic genera of bifidobacteria and lactobacilli have been extensively studied and established as valuable native inhabitants of the colon. Probiotics are defined as “living organisms, which upon ingestion in certain numbers, exert health benefits beyond inherent basic nutrition” (FAO/WHO 2000). The importance of a “healthy” gut microbiota has been recognized for a long time but only recently has specific attention been focused on the potential of probiotics as preventative and therapeutic agents in gastrointestinal diseases. The use of probiotics in animal models of inflammatory bowel disease and in diarrhoea of premature infants, severe burn patients, and acute and chronic colitis (Filho-Lima et al., 2000 , Lilly & Stillwel 1965, Gionchetti et al. 2000 ) has shown potential beneficial effects of probiotic Escherichia coli strains, Lactobacilli, Bifidobacteria, and Saccharomyces. However, the data in this area are relatively sparse and often controversial. Probiotics have been proposed to exert their beneficial effects by maintaining a normal intestinal milieu, by stimulating the immune system, by detoxifying colonic contents, by lowering serum cholesterol levels and promoting lactose tolerance, and by producing metabolites that are essential to maintain intestinal health ( Lilly & Stillwell 1965, Resta-Lenert et al. 2001 ), reduces or eliminates ailments such as colon irritation, constipation and travelers diarrhoea, inhibition of pathogenic bacteria, synthesis of B vitamins, lowering of blood ammonia levels, cholesterol absorption, and inhibition of tumour formation (Roberfroid, 2000; Ziemer & Gibson, 1998). However, in order to provide health benefits, it is essential that there is a minimum of one million viable probiotic organisms per gram of a product (Shah, 2002). Because of Probiotics have a limited shelf life food and nonfood applications. . Freeze-drying is a process that helps maintain a sufficient quantity of viable probiotics. During freeze-drying, the frozen water is removed by sublimation, thus reducing damage to biological structures. Previous research has found that certain strains of probiotics are better able to survive the freeze-drying process (Rybka & Kailasapathy, 1995). Reasons for this include differences in the surface areas of the microorganisms, and variations in cell wall and membrane composition. During the processing and storage of freeze-dried food, oxygen content, high temperature, low pH, water activity and elevated solute concentration may all affect the viability of probiotic organisms (Carvalho et al., 2004). Probiotic strains vary in their susceptibility to freeze-drying. Since Chang proposed microencapsulation as an alternative to creating ‘artificial cells' to define the concept of bioencapsulation over 40 years ago (Chang, 1964), large numbers of attempts to entrapment cells and other biological materials in different capsule types have been carried out (Orive et al., 2002). The membrane of the microcapsules permits the entry of small molecules such as nutrients and electrolytes and exit of toxic metabolites, hormones and other small bioactive compounds; while excluding antibodies and T-cells, thus protecting the encapsulated cells or tissue (Surita et al., 2005). It is a promising strategy for the controlled, localized and long-term in vivo delivery of therapeutic peptides to the hosts (Orive et al., 2003). A variety of polymers, such as chitosan, polyacrylates, alginate, polyamino acids, and polyamides, have been used to make microcapsules ( Surita et al., 2005). Alginate–polylysine–alginate (APA) microcapsule is one of the most widely studied microcapsules for: (1) a large number of published data from independent laboratories is available, (2) the alginate–PLL was the first system utilized to fully explore the challenges awaiting the encapsulation technology and (3) most findings with this system are pertinent to encapsulation systems pursued for other applications (Hasan et al., 2000). The microcapsules provide a special microenvironment in which the cells are cultured greatly affect the cellular behaviors, such as, cells always formed aggregates and organized into three-dimensional structure to proliferate, differentiate and function (Chia et al., 2005). Microencapsulation of probiotics can be carried out with natural polymers to reduce cell losses during processing. The protective encapsulating coatings protect probiotic organisms from the digestive extremes of gastric acid and bile salts. Microencapsulation can also be used to regulate fermentation by lactic acid producing starter culture (Ravula & Shah, 2001). Prebiotics as microencapsulation can be added to maintain the viability of probiotic organisms during freeze-drying. Prebiotics are defined as non-digestible food ingredients that may beneficially affect the host by selectively stimulating the growth and/or the activity of a limited number of bacteria in the colon (Roberfroid, 1998). The microencapsulation additives used in the frozen storage of microorganisms (viruses, bacteria, fungi, algae, and protozoa) include a variety of simple and more complex chemical compounds, but only a few of them have been used widely and with satisfactory results: these include dimethylsulfoxide (Me2SO), glycerol, blood serum or serum albumin, skimmed milk, peptone, yeast extract, saccharose, glucose, methanol, polyvinylpyrrolidone (PVP), sorbitol, and malt extract. These components generally improve the resistance of freezing. In this work a combination of microencapsulation agents (A) saccharose, gelatine and sodium glutamate. (B) Skim milk, glycerol and CaCO3 (C) skim milk, saccharose were used as microencapsulation agent in the freeze-drying of probiotics bacteria, which is based on literature data on particular components. (Desmons et al. 1998, De Man et al. 1960, Harris 1954, Tamime et al. 1985). The obtained data were analyzed in terms of the number of surviving organisms and compared with data obtained with a commercial medium – A consisting of saccharose, gelatine and skim milk. Both media contain sugars which act as dehydrating agents reducing the amount of intracellular water. Milk and gelatin are protective colloids. Glycerol, which modifies the rate of crystal growth and membrane permeability, was included in medium B (Fonseca et al., 2000). In this investigation novel hybrid entrapment protocol of probiotic microorganism was proposed based on microencapsulation and entrapment by alginate gel layer. This is considered very attractive in that it is better biocompatibility and this (Alginate / microencapsulation + viable cells + microencapsulation / Alginate) membranes allow sufficient diffusion of nutrients and metabolites to maintain growth of microencapsulated cells. Bacteria strains: The organisms used in this study included two strains isolated from human Lactobacillus platarum No. 8P-A3 (L.B.A3) and Bifidobatrium bifidum No.1, 791 (B.B.791) , and identified by Gut Research Group, Department of Microbiology, Kazakh National University Named Al-Farabi, Almaty, Kazakhstan. Media preparation: A very good, commercially available medium for the growth and maintenance of probiotic culture is MRS (Oxoid Ltd.) supplemented with Lactose (MRSL) . Media were prepared and autoclaved for 15 min at 121°C. probiotics strains were stored on MRSL-agar medium and subcultured at 37oC for 48 hr in MRSL broth, and 0.05% L cysteine·HCl was added for Bifidobatrium bifidum No.1, 791 (B.B.791) culture. Hybrid entrapment system for probiotics cultures: Probiotic microorganisms were microencapsulated using a modified method of Reyed (2007). Lactobacillus platarum No. 8P-A3 (L.B.A3) and Bifidobatrium bifidum No.1, 791 (B.B.791) were grown in MRSL broth at 37°C for 24h and then harvested by cooling centrifugation for 20 min at 10,000 rpm in an J-20 Beckman refrigerated centrifuge. Cells from 50 ml of the broth were suspended in 100 ml of the microencapsulated agents medium A) 10% saccharose, 5% gelatine and 2% sodium glutamate, B) 10 % skim milk, 5 % glycerol and 0.1 % CaCO3. C) 10 % skim milk, 5 % saccharose. Then entrapment in 100 ml of a sterile alginate solution (Loba Chemie, Mumbai, India) at a final concentration of 100 mL of sterile 3% v/w sodium alginate for 45 min., The mixture was slowly through a syringe needle in the form of droplets to free-fall into calcium chloride (0.1 M), a hardening solute ion or setting bath. Membrane was formed immediately on the surface of the microcapsule droplet by ionic interaction. The size and shape of the beads depend on the diameter of the needle and the distance of free-fall, respectively. This method is the most popular due to its ease, simplicity, low cost, and gentle formulation conditions ensuring high retention of cell viability. After 1h, the formed gel beads were then transferred to saline solution (0.85%) to enforce the gel structure and then, the hardened gel beads were transferred to distilled water, and gently stirred for 1 h to wash the residual calcium chloride. The microencapsulated probiotic bacteria entrapment in calcium alginate beads were subsequently for lyophilization. Preparation of Cultures for lyophilization: The optical densities and pH of both cultures vs. each matrix were estimated . Special attention was paid to the beginning of the early stationary phase. Many data have confirmed that prior lyophilization the cultures must be harvested in the early stage of the stationary phase. After drying, the cultures obtained after lyophilization were diluted. The survival rate of the microorganisms was enumerated in soft MRSL agar by the agar plate counting method. Enumeration was carried out using the agar plate count method, as for the samples before lyophilization. This was the method used for quantifying the survival rates of the cultures during lyophilization. All the experiments were carried out in triplicates. Despite the suitability of alginate as the entrapment matrix material, gel entrapment in alginate has some limitation due to low stability in the presence of chelating agents such as phosphate, lactate, and citrate. The chelating agents share affinity for calcium and destabilize the gel (Smidsrod & Skjak-Braek, 1990). Thus, stability problems are encountered during lactic acid fermentation (Roy et al., 1987) and cause cell release from the beads. Therefore, special treatments, such as Compatible microencapsulating agent may be added to media mix prior to fermentation to assist in the adaptation of probiotics to the environment. As well-suited microencapsulating additives is reduced the osmotic difference with their external environment (Kets et al., 1996), and entrapped with Ca-alginate matrix, are applied in order to improve the properties of encapsulated beads. Entrapment beads not only prevent cell release but also increase mechanical and chemical stability. The results presented in our study shows that the cell concentration before lyophilization was about 7 x 109 CFU/ml, pH for B.B 791.and L.A. A3 2.0 ; 2.09 respectively and O.D.550nm for B.B 791 and L.A. A3 1.9; 1.7 respectively. The fermentation profile for cultures pH, O.D. and number of viable cell for microencapsulated and Hybrid entrapment beads before and after freeze-drying is summarized in Fig.1 and 2. Figure 1: pH and O.D. for both cultures before and after lyophilization. A) 10% saccharose , 5% gelatin and 2% sodium glutamate. B) 10 % skim milk, 5 % glycerol and 0.1 % CaCO3. C.) 10 % skim milk, 5 % saccharose. D) 10% saccharose,5% gelatin and 2% sodium glutamate entrapment with Ca-alginate. E) 10 % skim milk, 5 % glycerol and 0.1 % CaCO3 entrapment with Ca-alginate. F) 10 % skim milk, 5 % saccharose coated with entrapment with Ca-alginate. Figure 2: The number of viable cells before and after lyophilization. A) 10% saccharose , 5% gelatine and 2% sodium glutamate. D) 10% saccharose , 5% gelatine and 2% sodium glutamate entrapment with Ca-alginate. pH, O.D. and the viable cell number of the two systems different from that of the free cells because of the rate limitation imposed by external and internal diffusion and adequate substrate supply in encapsulated and hybrid entrapment membrane (Godjevargova & Gabrovska 2006). The survival rate of the cultures after freeze-drying was estimated in terms of the number of surviving microorganisms Fig. 3. The achievement of Hybrid entrapment beads was estimated in terms of the number of surviving organisms after lyophilization. For both cultures, the survival rates were better in Hybrid entrapment matrix D than in matrixes A, B, C, E and F.
F) 10 % skim milk, 5 % glycerol and 0.1 % CaCO3 entrapment with Ca-alginate. G) 10 % skim milk, 5 % saccharose coated with entrapment with Ca-alginate. 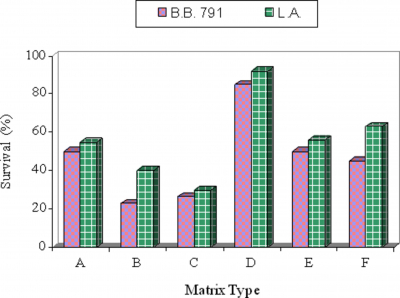 It was observed that the new Hybrid entrapment media (D) gave better results in the freeze-drying of B.B 971 (85.0 %) and L.B.A3 (92.0 % ) than other protective agent. The best method for protect these cultures is lyophilization with optimization of the Hybrid entrapment beads, cells mass and process conditions, by using this methods, the cultures should be collect in the early stationary phase and then mixed with the microencapsulating media and directly coated with sodium alginate. B.B 971 and L.B.A3 in the Hybrid entrapment medium with 10% saccharose, 5% gelatine and 2% sodium glutamate had a percentage survival of 85.0 % and 90.0 % respectively. The resistance of freezing is improved by adding a microencapsulating carrier such as 10% saccharose, 5% gelatine and 2% sodium glutamate. The addition of protectant microencapsulating agents during freeze drying of lactobacilli has been used to help overcome inactivation during drying and stabilization during storage. These results do coincide with those reported by Kearney et al., 1990, Kebary et al., 1998, and Sheu et al., 1993) because these agents reduced ice crystal formation by binding with water.. Thus, Hybrid entrapment beads facilitates the manufacture of fermented dairy products in which the bacteria have higher survival rate after lyophilization, than microencapsulating probiotics bacteria. Definitely, the most important characteristic of the functionality of probiotic cultures is their ability to support human health at the site of action. However, previous to achieving this, the cultures must be ingested and survive gastric transit in adequate numbers to elicit their effects. Given that most intestinal isolates can be difficult to cultivate in vitro, the efficient delivery of live cultures represents a major challenge in probiotic product development. In this mini review, I have attempted to outline novel approach to improve the survival of probiotic strains during processing in food systems such approaches range from Microencapsulated of the probiotic strains to Hybrid entrapment in Ca- alginate. It is hoped that these innovations will result in more efficacious and diverse probiotic products in the future, leading ultimately to improved consumer health. The author would like to acknowledge Dr. Mukund Thattai. National Center for Biological Sciences “NCBS”, Bangalore, India, for providing financial support to carry out this research and Indian National Science Academy, Chenni, Tamil Nadu, India , for supporting him with Fellowship. r-0. Chang, T.M.S., 1992. Hybrid artificial cells: microencapsulation of living cells. Trans. ASAIO 38, 128–130. r-1. Chia, S.M., Lin, P.C., Quek, C.H., Yin, C., Mao, H.Q., Leong, K.W., Xu, X., Goh, C.H., Ng, M.L.,Yu, H., 2005. Engineering microenvironment for expansion of sensitive anchorage-dependent mammalian cells. Journal Biotechnology. 118, 434–447. lactobacilli. Journal of Applied Bacteriology, 23, 130 -135.
r-3. Desmons, S., Krhouz H., Evrard, P. and Thonart, P. 1998. Improvement of Lactic Cell Production. Applied Biochemistry Biotechnology, 70-72, p. 513-526.
r-4. FAO/WHO. 2002 . Guidelines for the evaluation of probiotics in food. Report of a joint FAO/WHO working group on drafting guidelines for the evaluation of probiotics in food. http://www.who.int/foodsafety/fs_management/en/probiotic_guidelines.pdf. r-5. Fonseca, F., Beal, C., Corrieu, G. 2000. Method to quantify the loss of acidification activity of lactic acid starters during freezing and frozen storage.Journal Dairy Research. 67: 83–90. r-6. Godjevargova T., Gabrovska K. (2006). Influence of matrix on external mass transfer resistance in immobilized urease membranes. Enzyme and Microbial Technology. 38. 338-342.
r-7. Harris, R. J. C. 1954. Biological Application of Freezing and Drying, Academic Press, Inc. Publishers, New York, , pp. 37– 54.
r-8. Hasan, U., Paul, D.V., Patrick, A.T., 2000. Technology of mammalian cell encapsulation. Advanced Drug Delivery Review. 42, 29–64. r-9. Hubalek, Z. 2003. Protectants used in the cryopreservation of microorganisms. Cryobiology, 46, 205–229. r-10. Kearney, L., Upton, M., & Loughlin, A. 1990. Enhancing the viability of Lactobacillus plantarum inoculum by immobilizing the cells in calcium-alginate beads. Journal Applied and Environmental Microbiology, 56(10), 3112–3116. r-11. Kebary, K. M. K., Hussein, S. A., & Badawi, R. M. 1998. Improving viability of Bifidobacteria and their effect on frozen ice milk. Egyptian Journal of Dairy Science, 26(2), 319–337. r-12. Kets, E. P. W., Teunissen, P. J. M., de Bont, J. A. M. 1996. Effect of compatible solutes on survival of lactic acid bacteria subjected to drying. Journal Applied and Environmental Microbiology, 62, 259–291. r-13. Orive, G., Hernandez, R.M., Gascon, A.R., Igartua, M., Pedraz, J.L., 2003. Survival of different cell lines in alginate-agarose microcapsules. European Journal Pharmaceutical Science. 18, 23–30. r-14. Orive, G., Ponce, S., Hernandez, R.M., Gascon, A.R., Igartua, M., Pedraz, J.L., 2002. Biocompatibility of microcapsules for cell immobilization elaborated with different type of alginates. Biomaterials 23, 3825–3831. r-15. Reyed M. Reyed. 2007. Biosynthesis and properties of extracellular amylase by bioencapsulation bifidobatrium bifidum in batch culture, Australian Journal of Basic and Applied Sciences. (in press). r-16. Roberfroid, M. B. 2000. Prebiotics and probiotics: Are they functional foods? American Journal of Clinical Nutrition, 71(6), 1682–1687. r-17. Roy, D., Goulet, J., Duy, A. 1987. Continuous production of lactic acid from whey permeates by free and calcium alginate entrapped Lactobacillus helveticus. Journal of Dairy Science, 70(3), 506–513. r-18. Shah, N. P. 2002. Bifidobacterium spp: Applications in fermented milks. In Encyclopaedia of Dairy Science (pp. 147–151). London: Academic press. r-19. Sheu, T. Y., Marshall, R. T. 1993. Microencapsulation of lactobacilli in calcium alginate gels. Journal of Food Science, 54(3), 557–107561. r-20. Smidsrod, O., Skjak-Braek, G. 1990. Alginate as immobilization matrix for cells. Trends in Biotechnology, 8(3), 71–78. r-21. Surita, R.B., Sarwat, F.K., Susan, C.R., 2005. Polyelectrolytes for cell encapsulation. Current Opinion Colloid Interface Science. 10, 45–51. r-22. Tamime, A. Y., Robinson, R. K., 1985. Yoghurt Science and Technology, Pergamon Press, pp. 328–340. r-23. Ziemer, C. J., Gibson, G. R. 1998. An overview of probiotics, prebiotics and synbiotics in the functional food concept: Perspectives and future strategies. International Dairy Journal, 8, 473–479.